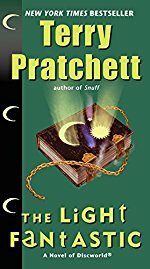 Book 2 in our Publication Order read through of the Discworld novels by Terry Pratchett. I actually liked this one rather less than The Colour of Magic. It reminded me of the Dirk Gently novels, where at some point, I look up and say, "I have no idea of what is happening right now." The individual sentences are fine, but the plot overall feels very...clotted. A more complete story than Colour of Magic. Introduces Cohen the Barbarian and Ysabell, Death's daughter (adopted). The Librarian turns into an orangutan, Death's a little more... uh, fleshed out, and the (Arch)Chancellor is a Weatherwax (which you'd think would earn a mention in the next book, but takes about a dozen more books to resurface). I enjoyed the story more than CoM overall. He's not quite developed his full style, but there's enough fun bits and playful language to make it enjoyable. This is about the fifth time I've read it, though, and I think the fun comes more from those extra bits. Was very bored of it the first time I read it. I've read TLF once, during my 'must give the series respect' readthrough, and nah. Twoflowers could have been a good commenteriat for the farcical world, but stereotypism/racism. The Discworld computer games - back in the mid-late 90's - they were Discworld-ey and Rincewind-centric, but they never endeared themselves to me for some reason. Translation errors between prose and adventure game? Would not be surprised. English < > American < > World, too. Or maybe I just don't like the Rincewind thing (from all angles). DEATH's amazing story arch starts here, though. But it isn't essential. I think picking it up in 'Mort' is fine. Are there thing's I've missed about Ysabell? I enjoyed this one although I've read it back-to-back with CoM and don't quite remember where one leaves of and the other starts. TCOM ends with Rincewind and Twoflower falling over the edge of the Disc. I'm glad I wasn't the only one having trouble following along. I kept having to re-read parts because I just couldn't understand what was happening. I enjoyed it, even if it did make me doubt my own intelligence. I always think of the two books as basically just one unit, but I would agree that it gets a little lost in the weeks in the second half here. I don't think there's a single Pratchett fan who wouldn't agree that these early books are rocky and uneven at best, and that they are notable only for the seeds of brilliance that you can spot here and there that would later blossom. I'm actually looking forward to revisiting these first two after I've gone through the rest of the series. Are there thing's I've missed about Ysabell? Not in this one, no. Much like The Patrician in Colour of Magic (who may or may not be Veterinari) and the Librarian in this one, she appears but doesn't impact the story much. In these early ones Pratchett puts a ton of one-note characters in, and then revisits them in later books to actually turn them into detailed characters. As we'll see with Granny Weatherwax in the next book, sometimes he creates an interesting character to fit a story only to have them bend the world in later stories (and requiring a little bit of retrofitting with the character). Ysabell's appearance (and Death, come to think of it) is mostly noteworthy for what he does with the character after. Cohen's another example. Here he's a quick sendup of Conan as an old man, but in Interesting Times and The Last Hero he blooms because instead of being a joke he becomes real. Next book is up: Equal Rites.